Morning, noon or late night—there’s no wrong time for a cheeseburger Pop Tart. This savory pastry is filled with seasoned ground beef that's mixed with shredded Colby Jack cheese and grilled to a crisp-on-the-outside, steamy-on-the-inside perfection. 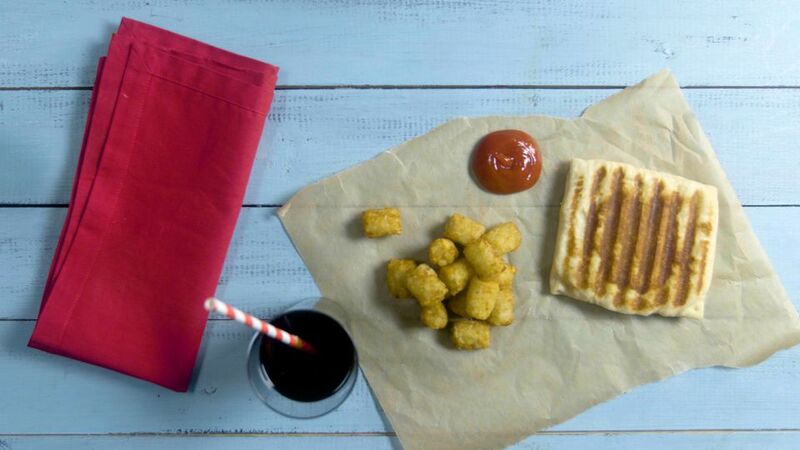 Serve with ketchup for dipping, and make it a complete meal with a side of tots. In a skillet over medium heat, add the oil and ground beef. With a wooden spoon, stir occasionally and break up beef into small crumbles. Once meat is browned, add the salt, onion, and garlic and mix well. After a minute or two, add the Worcestershire sauce and shredded cheese and stir until combined and the cheese is melted. Remove cheeseburger mixture from heat and set aside. Working quickly with chilled dough, roll out a prepared pizza crust. Cut into 6 squares. Place one slice of American cheese onto three of the squares. Top each cheese slice with 1/3 cup cheeseburger mixture, spreading it out slightly. Place sweet relish on top of meat mixture, then cover with one more slice of American cheese. Brush the beaten egg on the edges of the dough, then top with the remaining prepared pizza dough squares. Use a fork to seal the edges, trimming excess dough if necessary. Cook on a griddle over medium heat for 5 minutes per side or until dough is cooked through. Serve with tater tots and ketchup.